Buncombe Turnpike: ‘An Appalachian Evening’ Summer Concert. 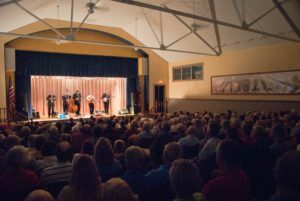 Buncombe Turnpike plays a variety of heartfelt tunes ranging from traditional and contemporary bluegrass to gospel and handcrafted originals. With their crowd pleasing demeanor, seasoned musicianship, and powerful vocals, the band has made a name for themselves among traditional and contemporary listeners alike. Adults $15; Students/K-12 $10; plus tax. All concerts at 7:30 pm in the air-conditioned Lynn L. Shields Auditorium. Dinner available for purchase in the Schoolhouse Cafe beginning at 6 pm. Featured artist: Shirley Grant, Smoky Mountain Rock Art.